Six Chinese ships entered Japanese waters near a group of disputed islets claimed by both Beijing and Tokyo early on Friday, ignoring the Japanese coast guard's orders to vacate its territorial waters. ­The first two ships in the battalion entered the disputed waters at around 21:20 GMT on Thursday. After a few hours of “patrolling,” three of the ships have left the disputed waters, while another three stayed, local media reported. 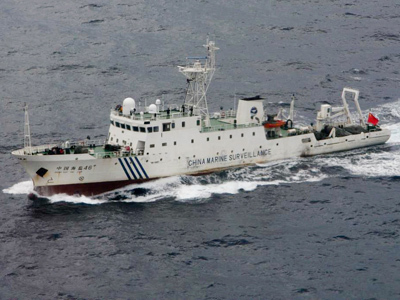 The Chinese Foreign Ministry confirmed that six of its surveillance ships had entered the waters near the islands. 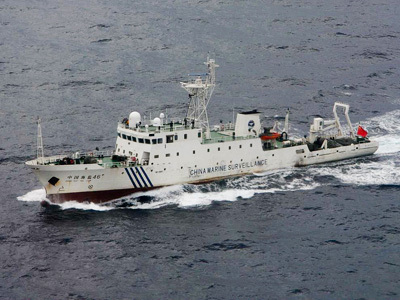 So far, Japanese border patrol ships have not taken any active measures against the Chinese vessels. “The patrol activity is intended to demonstrate the jurisdiction of the Chinese government over the Diaoyu Islands and the adjacent islands, and also to protect the country’s naval interests,” the statement reads. Japan has created a crisis headquarters in response to the incident. The country's officials urgently summoned the Chinese Ambassador to a meeting with the Japanese Foreign Ministry. This is the latest in a series of diplomatic rows between China and Japan centered on control of the Senkaku, or Diaoyu in Mandarin, islands. At that time, however, the vessels did not come within 12 nautical miles of the islands, an area Japan considers its territorial waters. 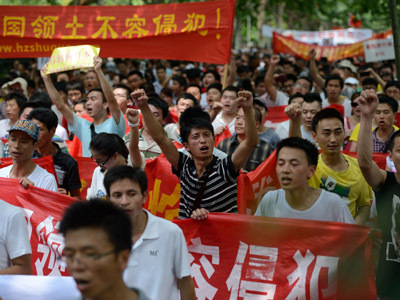 ­Meanwhile, the nationalistic spirit has taken a hold in China. Blogs and forums have been throbbing with discussion over various protests against the Japanese repatriation of the disputed islands. In Shanghai, an angry man was said to have driven his Honda Civic to a local dealership and set the vehicle ablaze. In Shenzhen, several Japanese-made cars have been smashed. The tourist industry is reacting as well by canceling plans to visit Japan in early October, when China celebrates its National Day. 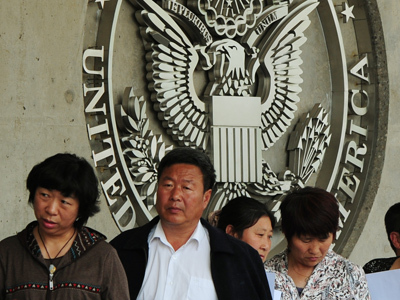 A couple in Kunming told the state-run Xinhua news agency that they had canceled a wedding photo shoot because the studio couldn’t meet their demand to take their pictures with cameras not made by Japanese companies, reports the Los Angeles Times. Many Chinese celebrities and politicians are refusing to travel to Japan. 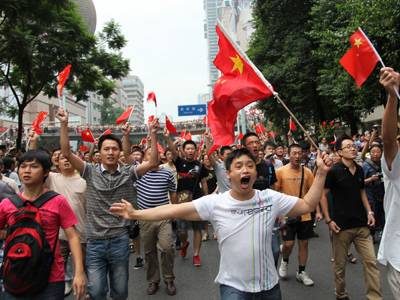 On Wednesday, a crowd of people demonstrated outside the Japanese Consulate General in Shanghai; and about 60 people rallied outside Japan's Interchange Association, Japan's de facto embassy in Taipei, to protest the nationalization move, as Taiwan also lays claim to the islands. Recently, Chinese state media began broadcasting weather reports for the islands for the first time.